Interpret "Odhecaton, Paolo Da Col"
Since its debut in 1998, Odhecaton has won many prestigious prizes for its recordings, reflecting critical recognition of the group’s having pioneered a new interpretative approach to the performance of polyphonic music: a fluid and expressive reading based on textual declamation. The name of the group is taken from the Harmonice Musices Odhecaton, the first printed book of polyphony published in 1501 by Ottaviano Petrucci in Venice. Their core repertoire encompasses the work of Italian, French, Flemish and Spanish composers of the 15thcentury. 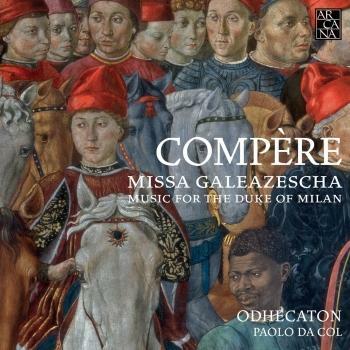 Directed by Paolo Da Col, Odhecaton brings together some of the best Italian male voices specialized in the performance of Renaissance and baroquemusic. The ensemble has made recordings dedicated to the music of Gombert, Isaac, Josquin, Peñalosa and Compère, and has helped rediscover the repertoire of 17th-century Spanish and Portuguese composers active in the Canary Islands. These programmes have seen Odhecaton being invited to appear in the leading European festivals, and won them important recognition in the world of recording: “Diapason d’or de l’année”, “5 diapasons”,”Choc” (Le Monde de la Musique), “Disco del mese” (Amadeus and CD Classics), and “Cd of the Year” (Goldberg). Beyond its central repertoire, Odhecaton has also presented a semi-staged production of Orazio Vecchi’s Amfiparnaso (directed by Enrico Bonavera, with scenery by Lele Luzzatti), and a production of sacred music by Gesualde da Venosa. Since 2008, Odhecaton has paid particular attention to the music of Palestrina. The group also works occasionally with instrumentalists specialized in their repertoire, including Bruce Dickey and Concerto Palatino, Gabriele Cassone, Liuwe Tamminga, Paolo Pandolfo, Jakob Lindberg and La Reverdie. singer, organist, conductor and musicologist - studied performance and musicology in Bologna. Since his youth interested in Renaissance and Baroque music, over the last twenty years he has been a member of various Italian vocal groups, including the Cappella di San Petronio of Bologna and Ensemble Istitutioni Harmoniche. Since 1998 he has directed Odhecaton, as well as leading various Baroque vocal and instrumental ensembles. Professor at the conservatorium of Trieste, he runs (with Luigi Ferdinando Tagliavini) the magazine L’Organo, contributes as a music critic to many specialised magazines (including Giornale della Musica), oversees the catalogue of the Bolognese music publisher Arnaldo Forni. He also prepares editions of instrumental music, has compiled a catalogue of musical collections, and has written articles on the history of Renaissance and baroquevocal technique.